The volume of this oil spill was more than six times greater than the Exxon Valdez spill. Lack of clear authority regarding corrective action resulted in almost all of its sixty-nine million gallons of oil being spilled. 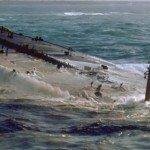 On March 17, 1978, a supertanker, the Amoco Cadiz, was stranded off the northwest coast of France when it lost its steering ability in a storm and ran on to rocks. The entire cargo of sixty-nine million gallons of crude oil spilled into the sea, covering neighboring beaches with one-foot-deep oil and causing enormous environmental damage. The oil spill was more than six times the size of the 1989 Exxon Valdez spill in Alaska. In the late 1960s and the 1970s, the average size of oil tankers increased to six times their traditional tonnage as more and more oil was being shipped from the Middle East to Europe and North America. Economies of scale demanded supertankers especially when local conflicts around the Red Sea blocked passage through the Suez Canal and ships had to travel all the way round the Cape of Good Hope. These huge tankers, each able to carry more than 200,000 tons of oil, gave rise to major environmental concerns. Ports were not accustomed to handle them and a single accident could be catastrophic. The first shock of the supertanker age came to Britain in 1967 when the Torrey Canyon, with thirty-eight million gallons of oil, went aground in the English Channel and lost most of its cargo, flooding the entire south coast of England with black masses of oil. It was the worst tragedy that the nation had ever experienced apart from war times. After all hopes of salvaging the rest of the ship’s oil had to be abandoned the British government bombed the wreck, a move that ignited and so burned up some of the remaining oil. Four years after the Torrey Canyon, two large oil tankers, the Arizona Standard and the Oregon, collided beneath the Golden Gate Bridge and 840,000 gallons of crude oil was spilled into the bay, spoiling beaches and killing thousands of birds just as had happened with the Torrey Canyon. This accident happened in the middle of the night and, though radar equipment was installed and working on both ships, little attention was paid by the ships’ captains to their positions relative to each other. The Arizona Standard was entering the bay while the Oregon was leaving. Environmentalists’ worst fears were realized when the Amoco Cadiz ran aground off the northwest coast of France, near Portsall, in 1978. It was the world’s worst ever oil spill up to that time. The previous two accidents involved much smaller volumes of oil. While six tankers travel along this coast daily, nothing at this scale had ever been imagined. The ship was a couple of miles off the coast when its steering system failed and the vessel drifted in heavy seas on to rocks. Weather conditions in this part of the Atlantic Ocean are usually stormy and March 17 was no exception. Having lost control, the ship was at the mercy of the waves and before long it broke in two releasing all of its cargo of 230,000 tons of crude oil into the sea. When the captain sent out a distress signal, a German tugboat that was nearby responded and its captain offered to tow the tanker away from the shore and farther out to sea, but at a price. That offer was made around the middle of the day and a three-way telephone conversation soon followed involving the captains of the tanker and tugboat and an official of Amoco, the ship’s owner, in New York. The price was $100,000, on the assumption that the situation was one of assistance, not emergency rescue. If it were the latter, costs do not apply as any neighboring vessel is under obligation to assist a ship in distress. The debate went on for twelve hours with the Amoco representative refusing to agree to any payment, insisting instead that the ship was in distress. French authorities were justifiably angry as they watched the ship drift closer and closer to the shore. They knew that the argument over costs was quite irrelevant as the price being charged was far less than the value of the cargo, yet they felt they were helpless to do anything. The French government wanted to take the Amoco official to court on charges of criminal negligence but later dropped that plan as a more general legal case on responsibility for the spill entered the courts. Amoco’s long-standing claim that it feels responsible for all environmental concerns and the welfare of the local people wherever it operates did not make much sense to French officials as they watched the tragedy unfold. They saw the tanker finally breakup on the shore and discharge its entire cargo of oil into the sea. Hundreds of thousands of tourists visit this coast annually and the economic impact of losing them weighed heavily on the minds of the local business community. Every effort was made to keep oil away from the shore but there was little experience to deal with such a large volume of oil. Skimmers did not work in the choppy seas, typical of this coast, and oil splashed over the tops of booms. Disillusionment with detergents in other spills persuaded them to avoid that approach. The French government thought of bombing the tanker in order to set it on fire and consume the oil still on-board but that was abandoned because the black fumes would damage crops and farms. The only effective course left was to clean the beaches after the oil washed ashore. In France, that job is always assigned to the army. All along the two hundred miles of coast soldiers used the only tools that would work—shovels. Oil-soaked sand was bagged and carried away while village fire trucks washed soil from rock surfaces. It was frustrating work as beaches would at times be covered with fresh sand, giving the impression that it had been cleaned while still full of oil underneath. Oil would sometimes accumulate to a depth of four inches in harbors, then suddenly be blown out to sea when the wind changed. Approximately 30,000 seabirds died from the oil and more than 200,000 tons of fish were also lost. Many communities along the coast lost their sources of income for more than the year of cleanup as shellfish habitats had to be rebuilt. Questions were asked in the wake of the disaster. Why did the French navy not respond to calls for assistance? The navy’s tugs were closer to the stricken vessel than the one that did offer to help. Why did the ship sail within six miles of land even though international agencies such as the United Nations recommend a minimum distance of fifteen miles from shore? Was the ship seaworthy? As often happens in shipping, the vessel, Amoco Cadiz, was registered in an African country in order to gain tax and insurance advantages for the owner. However, when the claimants finally sought damages from the owner, a U.S. judge decided that the oil company was guilty. The company was considered negligent on several counts including failure to train the crew adequately. The ninety French communities that had suffered most were awarded $85 million, about one tenth of their claim for $750 million. For the 400,000 people concerned, that amounted to less than $2,000 per person. In 1999, the French government arranged for divers to go down and examine the wreck of the Amoco Cadiz. It had measured two hundred feet longer than the Titanic and five times more capacious and divers discovered that much of the frame of the original was still in place. The hull stood 150 feet above the sea floor. The divers found the ship’s sides torn in several places, creating underwater sculptures of steel. There was no evidence of the oil spill and the seabed seemed quite clean. Swarms of fish covered the ship and each broken or twisted piece of rusty steel served as a potential breeding site. Flatfish like plaice, shoals of anchovies, and sand eels were common. The main bulk of the ship was far from being stationary. It moved gently under pressure from the ocean swell.